A visit to Sydney’s leafy suburb of North Turramurra is as refreshing as taking a trip to the country. Pop down to Bobbin Head National Park, breathe in the fresh air and immerse yourself in nature on the edge of one of the Hawkesburys sensational waterways. It’s the perfect secret Sydney spot to revive, and on your way out it’s an easy stop at The Cook’s Garden restaurant/cafe/bar in the quaint North Turramurra suburb. We arrive just as lunch is winding up, which to me is the perfect time for afternoon tea, and we’re hustled towards the bar – not a particularly quaint spot for a family gathering with your 80-year old mother. The dining room looks perfectly fine but the staff want to set up for dinner, and by chance we see the garden out back and invite ourselves to it. The garden is lovely and private and we discover is full of edible plants and herbs when we spy a chef collecting bay leaves. I think it’s easy to slip through the cracks here if you arrive between main meals, so don’t expect to be waited on, order at the bar (even if you are in the garden), which is out of sight. All that is forgotten when the scones arrive. 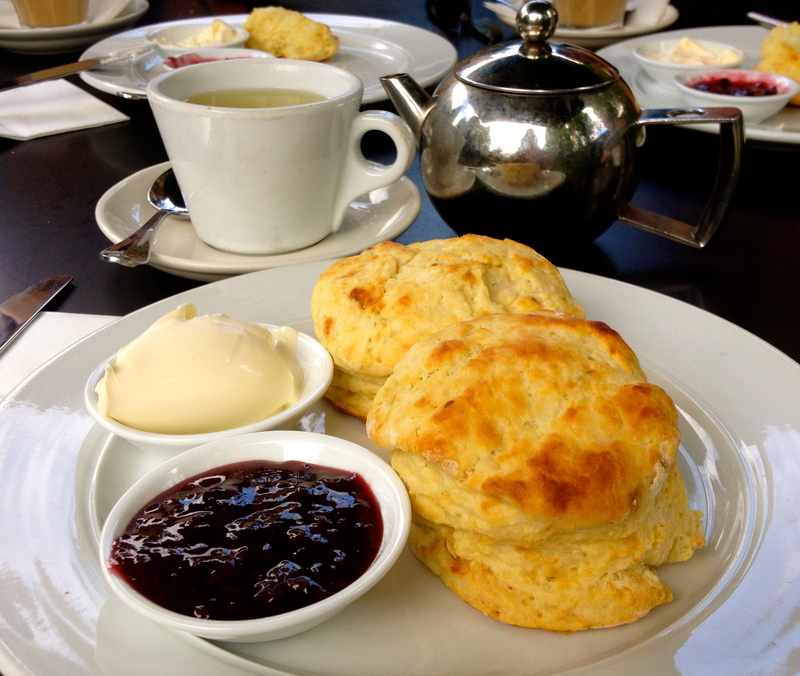 My cup and teapot could use a polish but the scones are fresh and perfectly baked: crispy on the outside and soft on the inside with no nasty aftertaste. The Drunken Sailor mixed berry jam is a hit with the group who aren’t fans of the sickly sweet cheaper varieties and the double thick cream is a nice finish. Tea: A small selection (six) of teas served in a small pot. Overall: It feels a long way from the hustle and bustle of the city.